MOSCOW, February 2. /TASS/. The United States started preparations to production of missiles of intermediate and shorter range banned by the Intermediate-Range Nuclear Forces Treaty (INF Treaty) two years before it accused Russia of violating the agreement, Russia’s Defense Ministry reported on Saturday. "Two years before making public unfounded accusations against Russia of alleged INF Treaty violations, Washington not only took a decision, but also started preparations to production of missiles of intermediate and shorter range banned by the Treaty," the report said. "Starting already June 2017, the program of expansion and upgrade of production facilities with the aims of developing intermediate and shorter range missiles banned by the Treaty was launched at Raytheon’s plant in the city of Tucson, Arizona," the ministry said with reference to compulsive evidence it has obtained. "The plant is a major diversified enterprise of the US aerospace industry that produces almost all types of missile weapons," the report said. The ministry noted that "over the past two years the space of the plant has increased by 44% - from 55,000 to 79,000 square meters, while the number of employees is going to rise by almost 2,000 people, according to official statements." 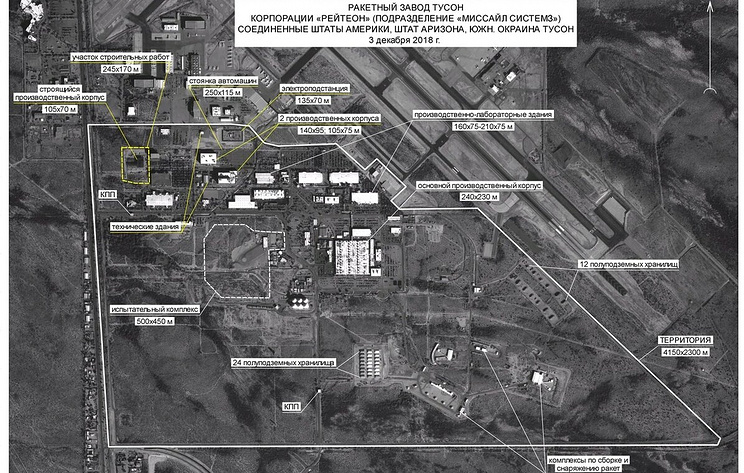 "Almost at the same time as production facilities expanded, on November 2017, Congress provided the first tranche amounting to $58 mln to Pentagon, directly pointing at the development of a land-based missile of intermediate range. Consequently, the nature and time of the works demonstrate beyond reasonable doubt that the US administration decided to withdraw from the INF Treaty several years before unfounded accusations against Russia of violating the Treaty were made public," the ministry concluded.